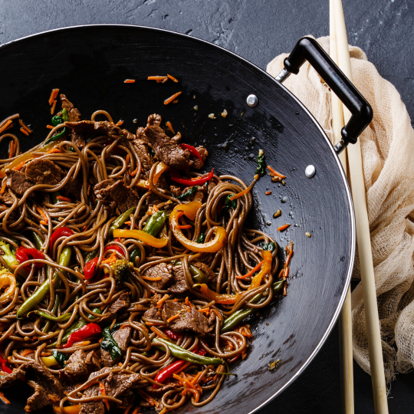 The trick with a stir-fry is to have all your ingredients prepped and ready to go before you start cooking since it comes together so quickly. First cook the noodles according to the packet instructions, then drain and set aside. To make the stir fry sauce, whisk all the ingredients together in a jug and check the seasoning. Heat the oil in a wok, deep frying pan or non-stick pot until it's almost smoking. Add the seasoned pieces of steak and stir-fry for 1 to 2 minutes. Throw in the carrot or sweet potato and keep it moving around the pan for 90 seconds. Add the peppers and cook for 2 to 3 minutes, then add the broccoli, pak choi, green beans and sugar snap peas and cook for 1 minute more. Add the shallot, garlic, chillies, if using, and the ginger and cook for 1 minute, stirring constantly so that nothing sticks. Pour in the sauce, then add the cooked noodles and toss everything together until well combined. Divide the stir-fry between your serving plates and garnish with the spring onions.